Apostle Islands National Lakeshore. Image: NASA Earth Observatory. The National Park Service recently released a gallery of satellite images that display the beauty of the agency’s parks and monuments on its 100th birthday. 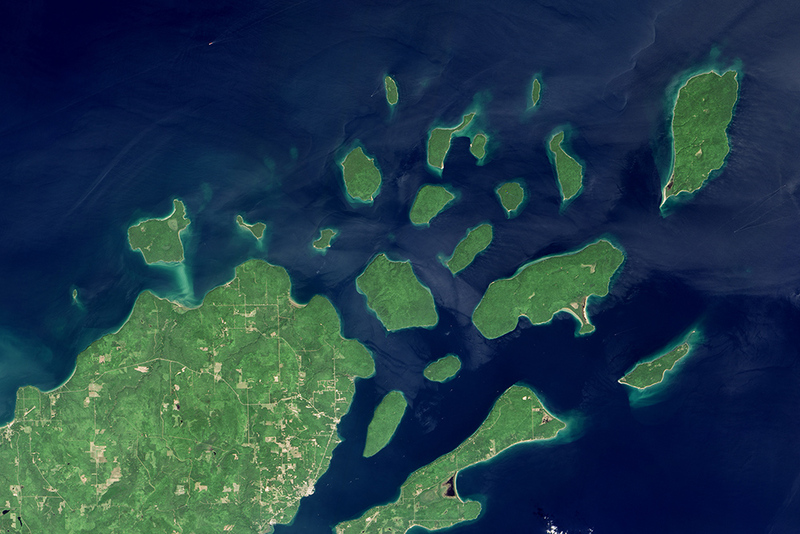 This view of the Apostle Island National Lakeshore off the northern tip of Wisconsin was taken by one of NASA’s satellites. The lakeshore includes all of the islands depicted in the image except for Madeline Island. The National Park Service has managed the lakeshore’s 21 islands since 1970. They are known for rock formations created by glaciers billions of years ago and that continue to be shaped by changing water levels, according to NASA’s Earth Observatory. The islands are home to many amphibians, which find shelter in freshwater rock pools along their beaches. Remains of old-growth forest and sea caves are among the other treasures found on the islands. The lakeshore is also known for its large collection of lighthouses, the oldest dates to 1857. With five lighthouses and four light towers, the Apostle Islands have more lighthouses than any National Park Service property. More 100th anniversary images are here.